Runner, Cyclist, Duathlete, and Clydesdale all at the same time. Yep, I’m back. No, I didn’t go anywhere. I’ve just been busy. Since the first of this year, my family’s budget has been much more strict. That can be problematic when you’re a triathlete, clydesdale or otherwise. It’s kind of normal that in the 21st century, everything is an industry these days. So, yes, there is the running industry, the triathlon industry, and I even work in the healthcare industry. Side note: In my own personal opinion and belief, healthcare of any kind should never be considered an “industry” in any sense. It should always and only be considered ministry, regardless of your religion. We should be working ourselves out of a job, not creating permanence and profit. That being said, industries have one primary goal in mind: setting their followers free from the green stuff in their pocketbooks and making them feel good about it. That’s not cynical, people, it’s just true. Industries are in it for making money. They exist because they have constituencies; followers. Runners need shoes, shorts, shirts, gels, sleeves, compression gear…and the list goes on and on. Get it–runners NEED this stuff (feel free to substitute cyclist, triathlete, etc.). And, it’s true that there are times when we do need the stuff, or it may help us in one way or another. However, many times, we just want it. Of course, for many triathletes, what we most want is the next race, or ride, or whatever event there is down the pike. Previously, during most of the year, I was budgeted to one event per month (except for special instances). One race or one ride. Now, even those will be hard to come by, so I am doing with less of them. I attended one ride this Spring, primarily because it was inexpensive and we didn’t have to travel far (and there was something for sweetie to do while I rode). I was able recently to sign up for the Dallas Half Marathon in December because of a birthday gift. No, I am not complaining, but I am learning a lot more about what it means to be a runner or a cyclist this way. I’ve learned I can do without Clif bars. I’ve learned I can do with just Gatorade. I already reported that while funds were available, I pre-bought two pair of running shoes so they would last. I’m keeping my 400 mile pair in service for short runs to make them last even longer. I’ve also learned to get more out of my workouts than just a notch up for the next race or event. Usually, by now, I am into full swing cycle mode for the Summer. That hasn’t happened this year. I have switched to doing long runs on Saturdays instead of going out and riding. Mainly because I can’t get any medium length ones during the weekdays. I was finding that if I got up at 4AM and did 6 to 8 miles, I was wasted for working that day. Also, by waiting until Saturday, I can run longer and get into better condition, all while seeing the sun come up. Much better, I think. But, I’ve gotten some riding time in as well. I’ve just had to be creative. I’ve loaded up the bike on the car and driven out to a large trail where I can ride safely on Sunday afternoons sometimes. Yes, that may be anathema to some, but it is better than nothing. A friend recently started up his Sunday morning group ride around town. Since I don’t have to be at church at 7AM any more, I can now ride. Also, much better. I’ve been working on a better running workout that is doing me some good right now. My weekday runs are limited to about 3 and no more than 5K at a time. Then on Saturdays, I’ve been working from 8 to 14 miles. I just finished the first cycle a couple of weeks ago and now I’m going from 9 to 14, then 10 to 14, then 12 to 14. After I finish that cycle, I’ll go back to 8 and start over again. I’ll let you know how it goes, but so far it has felt very good to get out and do the longer runs like I was doing for the marathon. I’m trying to hold 1,000 yds. in swimming, but I waffle some. I’m down to just one day as Mondays are seniors only at my pool. It’s a lot less busy that way and I can swim better. An Ironman friend of mine had been doing a workout where he ran to the pool, did his swim, then ran home. I’ve started doing that some. It’s a killer workout, to borrow a cliche, but well worth the effort. I hadn’t really been a running clothes horse. My only few important things I’ve had for a while; a couple pairs of compression shorts, and some really good socks, plus a pair of winter woolies and running pants for Winter. Almost all of my shirts are race shirts or were bought at Wal Mart or Target. You can get decent stuff there. I haven’t need any clothes this year, but if I did, I know where to look. It’s been different not racing or going to rides as much. I’ve been blessed with more great runs this way than usual. I am still getting to do new things. I’ve noticed I am running much faster than I used to run. It’s decently exciting to finish a long run on Saturday and discover you didn’t take as long as you thought. It’s also good to be able to run by the grocery store on your run and see folks you know. Running and working out is about a lot more than just the events. You really don’t have to have a lot of money to do it. You do need to have really good shoes though. There you cannot scrimp. That just requires planning and budgeting to make it work. I’ve been reminded a lot more lately of just what it means to be an athlete (or “late onset athleticism as John Bingham calls it). At my new job, I have been able to put into practice all those things I believe in about being a craftsman such as doing a good job just because it’s the way you do a job. Now, I’ve been able to apply those lessons to running, biking, and swimming. Doing them well just because you should and because you can. Triathlon training on a budget does work. Happy running, ya’ll! This will be just a quick post this evening. Things are going well at the new job. We are learning how to adjust to the changes around the house. While we were working on our cell phone plans to make them less expensive, I found a way to get my GPS tracking back without buying a new garmin. I broke my smartphone a couple months ago. Phone-wise, I have been fine with my older phone. But, my smartphone was how I tracked my rides and runs. Without it, I fell back on known routes and a stopwatch. In the process of swapping phones, I found out we couldn’t activate my wife’s smartphone on my account and lower the rate. It was going to just be left aside, but then I got a brilliant idea. Since the phone would still connect to wifi and I knew that Strava would work as long as it could access GPS, why not use it for runs. Sure enough, after downloading, installing, and setting up Strava on the phone, I could use it like a garmin. I took it out on this morning’s run. Worked like a champ. Yet, there are a few tiny drawbacks. I have to pull up Strava and make sure I am logged on before leaving the house. Additionally, it will not sync new runs or rides until it is connected to wifi again. But, those are small problems indeed. Keep this in mind if you have an older phone around or just have to upgrade. That older smartphone could be put to use for yourself or another runner. And, another good mark for Strava. Happy running! It has been a good two weeks since my last post. I have had a lot to do in that space of time. I started my new job and am getting comfortable and working on that task. I just finished my final exam today for College Algebra (Whew!). I survived a DNS outage and got ready for a presentation on the web site I’ve been working on. And, I’m still running mostly, sort of, kind of, regularly. I began work at the new hospital two weeks ago. I’m doing HVAC (heating, ventilating, and air conditioning) work for them, plus refrigeration. We’ve both been getting used to each other, though I think I probably have more adjustment to do than they do. I came from a “one person doing it all” kind of opportunity via a huge mega-hospital experience and have now stepped into small-town-cozy-but-very-energetic hospital experience. It’s a challenge sometimes, but I am adjusting and getting to learn everyone and our new systems. I just finished up two days of working evening shift, which I have never officially done before. It’s quite different, but it went well. I’ve managed to keep up my work and still get a few things done that we couldn’t during the day. I have a good crew of people to work with. Two other guys doing HVAC with me and a host of folks that handle lots of other things. They’ve been very helpful and friendly. I learned quickly after starting work there that this really is where I am supposed to be for right now. It’s a good place. Because of the new job, I managed to purchase my first pair of Nikes this weekend. I tried wearing some regular hard working shoes for two weeks, but they have been killer. I think I’ve become too accustomed to living in running shoes. I managed to find a pair of Nike Alvord 10 trail runners for work. Their main feature that I wanted–they were all black. Hopefully, they won’t get noticed and I’ll get to keep wearing them. They were certainly comfortable last evening. Our city’s bike lane task force is getting going again for the year. We had the first meeting this last Wednesday. I was on the agenda to show off the work we’ve done on getting a web site ready for bike advocacy in town, but it’s been quiet for a month or so. I happened to get a weird e-mail error from my server early this week and thought to check on it. I discovered my Internet provider had changed my home’s IP address and all of my DNS settings were now useless. Since the web site is based on WordPress, if the domain name isn’t right, the site doesn’t work. I still haven’t gotten the problem fixed, but I got a work-around done so that at least I could to the presentation. The web site was well received by the members and we’ll hope to have it up live soon. I have a few changes to work on and then get the ‘go ahead’ from our fearless leader. Speaking of our bike lane task force’s fearless leader. Our city is blessed by a lady that really knows her stuff on getting things like this done. She has been leading the charge for bicycle advocacy in our town for a few years now and we are seeing some of the rewards of her work. Things never move as fast as we would like, but things are looking up. We are getting more interested folks in what we are doing; though gas prices aren’t hurting our efforts either. Also, yours truly got an e-mail recently from a site called Pocket Change. It seems they liked my blog and sent me an Editor’s Pick award for the site. You can see it posted in the column on the right. It’s always good to get noticed for your work. Though, at this stage in my writing, I do it just for the fun and to get to know others out there. In addition, WordPress sent word a while ago that I’ve kept the blog up and running for three years. That’s probably not long unless you count it in World Wide Web years. I’ve just finished up my first semester back in college with my Algebra final exam this morning. I think I passed, maybe. With all the other stuff going on, I think I’ll let that be enough for now. It was much harder that I expected, especially getting used to all the new technology of classwork on the Internet. I learned a lot though and much of it may be useful on the new job. We’ll see. Running has been doing alright. Back working in a hospital means lots of walking every day. Not wearing decent shoes hasn’t helped how my legs and feet feel in the morning when I get up to run. I’ve kept close to my weekly quotas that I set, but I am a bit behind. I had hoped to be further along towards my 20 mile weeks by now, but I will have to be happy where I am at, not where I wish I were. I am hoping for milder weather for a bit. Twenty-something to thirty-something degree mornings get old in a hurry. However, the quality of my runs is doing quite well. I’m running a little slower than in October/November, but it is still going well. It’s just been harder in the first mile or so to get going. I should be able to adjust as I get used to the walking. It’s side benefits are good though. I was able to record a five pound loss for last week. So, I am back down to my pre-Holiday weight (yippee!). I am also starting to move my swim lengths back up. I’ve kept them down to 600 yards each time so as not to interfere with my marathon training. Now, with that over, I can start to edge back up to 1000 yards soon and hopefully get to a mile by about Summer (I hope). Lots of new changes and adjustments. Which is often disconcerting to a guy like myself. I am a creature of habit and ritual. I like for those things that I do to be somewhat in a rut at times. When I can depend upon something being the same, I believe I am able to adapt to the changes that come my way. Notice I said believe. That may or may not be true. Lately, there have been many changes that seem to happen all at once (though probably not really). But, as Mark Lowry said once “this too shall pass,” which is from the Bible, but it was funnier the way Mark put it. Regardless of whether it suits me or not, I have to adapt to the change. Just like I do when the city road crews mess up one of my favorite running routes–detour through the neighbor’s yard and keep on going. Happy Running! Lots of folks that are running or cycling have used GPS watches (is that the right term?) to record their routes, pace, training, etc. For a few years, I also used a Garmin 305 that I was given at Christmas. It is the one piece of gear that is hard to give up. We runners especially often want to know our pace and distance. I have seen that quite a few folks have switched to using their smartphones for the same purpose. I also tried to use mine in place of my Garmin, but wasnt’ very satisfied. That was until a friend suggested I use Strava. In early September, my faithful Garmin gave up the ghost. Since they are kind of pricy, I couldn’t just go out and replace it. I needed another option to carry me through marathon training. Yes, in keeping with Murphy’s Law, it chose to die right when it’s really needed. I had used another app, which shall remain nameless, when I first got my smartphone. However, it was kind of a memory and power hog on my phone. It required access to the GPS and the 3G at the same time. Therefore it was not a good option. I spent a good deal of the Fall just using a stopwatch app and running already well tracked routes. I could probably write a whole post on low-tech running, though I think there are many other proponents already. It was enjoyable. I had to run just on my own pace monitoring my breath and body to do things correctly. For the most part, it did work, but that’s another story. I missed my Garmin, but I needed a quicker, cheaper alternative. Then, a friend told me I should try Strava’s app. Strava.com is one of the newer on-line ride/run loggers. I had looked at them briefly, once, but didn’t think about trying them further. When my friend gave them a good mark, I thought I’d try them out. Now, I see why. Rather than a large unwieldy app, Strava breaks theirs into two apps, one for cycling and one for running. Their basic screen isn’t any harder to use than a Garmin or a watch. What sold it to me was it’s ability to run in airplane mode. On smartphones, there should be an “airplane” mode where you can kill all of the radios for wi-fi and 3G/4G (whatever they’re calling it today). However, since GPS doesn’t usually transmit, it’s still on during airplane mode. Getting to use Strava during airplane mode means a great power savings during my runs and rides. The app is alright to be disconnected during airplane mode and when I press pause on the screen, it doesn’t automatically try to upload the data. Instead, there is a separate button to do so. Therefore, I have time to put my phone back into regular transmission modes and then allow Strava to finish the run/ride and upload. You can view all your routes and workouts on the smartphone or on the web. The second feature that I like is that on the phone, it provides splits and speeds. Since I use Linux and Garmin does not have a Linux version of Garmin Connect, I cannot view my splits across my runs. I don’t have to worry with that now since I can see mile splits on the phone as soon as I’m through running. In addition, on the cycling app, I can view a graph of the instantaneous speeds and see if I’m travelling well. With the speed graph, I can see where my speed is peaking during the ride. This is kind of important since I’m an urban rider and getting your average speed which includes all your traffic stops is misleading. The only problem I have run into with Strava, and it is a small thing, is that it counts movement time. I would prefer a setting that allows me to deselect that feature. I like to measure myself the same as it would be during a run or ride where all the time counts. I’ve used the Strava app for both running and cycling for a few weeks. It has been as easy to use as my Garmin was. Since I carry my phone with me, it might as well be doing something useful. Strava works simply and without drawing on as many resources as some other apps do. I think I’ll keep using it. Merry Christmas to all and happy running! It seems that this new cold front is getting here just in time. Tomorrow is the Cool Run 10K/5K in my town. It’s held each year at the end of October by a local foundation to help raise money to fight cancer. It was the first race I ran four years ago in 2008. I have run the 10K each time and have improved each year. Last year was my best at 1:06:10. I’m still looking for that 1 hour or less 10K. It’s a really fun race and the organizers put on a good one for the runners. It’s local, but it does bring out some of the better runners from around the area as well as a good showing from the high school cross country teams. I run it with a group of runners called Jo’s Team which honors a person we all knew that we lost because of cancer. In addition to good running, it’s got the best food I’ve been to for any race of this size. A local pizzeria named I Fratelli’s is right next door to the race and always brings out some of their great pies. I’ve been fond of this race for a number of reasons. It was my first and that is special. It is also a good benchmark for where I am at in just running improvement. I’ve been able to observe that I have gone from someone just barely able to finish the 10K to actually thinking I can compete, sort of. Finally, it is also a good warmup for whatever I’m doing in December, whether it be a half or the full as I’m doing this year. However, I want to take a little while today to talk about a large (I mean really) project I am working on with a friend. We are trying to build a web site for our city that will help us provide road and path data to the city on where cyclists are riding and commuting. With this data we can help inform the city on where infrastructure and enhancements are needed because of known traffic patterns. It will be a little similar to a site like mapmyride.com except that it will focus just on our city and we’ll be able to pull reports out of the database for presentation work (we hope). Currently, the only thing you can do at the site, which you can access here, is to select a starting address, plot a route on the map, and you can print out a list of the latitudes and longitudes from your route. Probably none of this will be quite the same in the final version. But, I am interested in getting folks’ reactions to it. Though there are still many things to do just on this portion of the mapping, I will have to turn it aside for a bit to start working on the database portion. The concept is that cyclists will be able to come to the site, register and provide a little bit of demographic data, then map the routes they often use for commuting or other reasons. 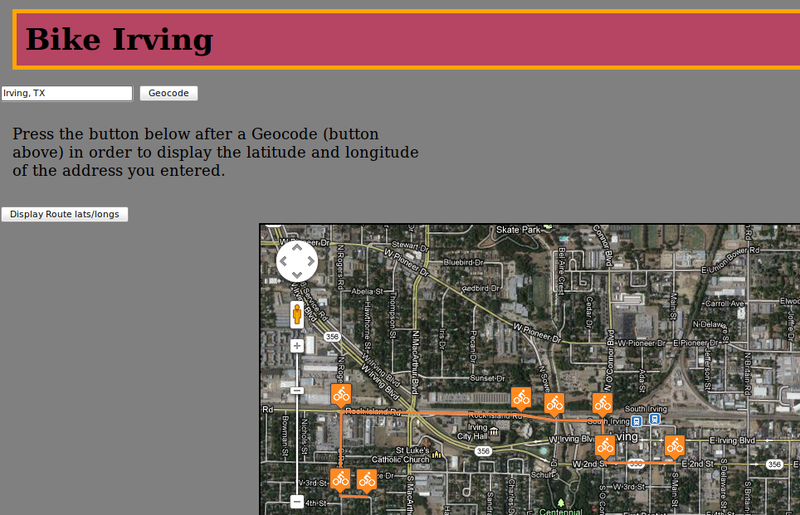 Then, on the back end, we can pull up common maps showing multiple routes and where these intersect with roads. To do that, I will have to build a database of users and a database of routes, plus a content manager to help us use the site. It will also be a place to post events about and for cycling in our city. Because it’s a public site, we’ll also need to put a privacy notice in place and establish means to keep folks information private. I have no idea how long it will take to finish such a site, but I am making progress. I’m going to be getting some help on it soon, I think. Currently, I have it hosted on my own server. I don’t yet know where the final location will be, just yet. In the meantime, I’m still job hunting. Still trying to be patient and wait upon God‘s timing for how things will go. I am encouraged by seeing where He is working in the process this week. So, this afternoon, I’ll spend some more time on the web site and tomorrow, I’ll just go and have a Cool Run in the morning. Happy Running (and Cycling)! I am a pretty loyal Asics fan. And, I am a pretty loyal fan of Luke’s Locker. I got to find out why I am a fan of both of these companies this past week when my brand new pair of Asics gel-Nimbus 14’s developed a problem. Almost on the last day of September, we stopped at Luke’s Locker in Dallas to get my next pair of gel-Nimbus running shoes. Based on the recommendation of a friend, I went to Luke’s Locker to get my first pair of real, well-fitted, running shoes a few years ago. Carlton was the salesperson there that measured me up and put me in a pair of gel-Nimbus 10’s at the time. Though I’ve tried a couple others, nothing works like the Nimbus. But like all running shoes, they must be replaced, thus my trip again to Luke’s Locker. I phoned ahead to make sure they had my size and in a pouring rain and traffic from an SMU–TCU football game, we made it in and out to get my new pair. Though this isn’t a story about shoe tech, I wear the gel-Nimbus because they fit my neutral foot and have just about the most cushion one can want in a running shoe. For a clydesdale runner, they work well, in my own opinion. My other distinct feature is a very wide foot, hence why I call ahead before going. They don’t carry many 4E shoes. I took my new pair of Asics home, broke them in, and wore them for only a week’s worth of runs. Last Tuesday evening, while taking them off, I noticed part of the ‘A’ on the side was coming loose. I had room to stick a finger between the strapping and the mesh. Bummer. Defective shoe. The real problem with dealing with replacing a pair of my running shoes is the travel time. I only stopped at the Dallas Luke’s Locker because we were going right by it, but none of the others are close either. On a side note, it’s a real problem with my town. No bike shops and no running stores. I even have to travel all the way to the north end of town (and that’s quite a way too) even to find a regular sporting goods store, which is no help really. How would I handle this situation? I know! I would leverage the world of social media! I took a pic of me sticking my finger in the hole in my shoe and posted it for Asics and Luke’s on Twitter. And, it worked. Luke’s Locker’s Twitter person got back with me quickly and set me up to receive a call from the Dallas store manager the next day. Not only did the store manager call, he called early the next morning. We talked briefly with me wondering just when I would get round to going all the way to Dallas to trade the shoes. However, the manager just asked me which was the closest store and when I said the Colleyville Luke’s Locker, he set up for me to trade my shoes there instead of having to go to Dallas. A day or so later, I got a call from the Colleyville manager to find out what my plans were. I told him I was going to come to his store the next afternoon. He had the right size gel-Nimbus set up for me and the store associates took care of the trade off just fine. Now, it’s not really bad that my shoes were defective. The law of averages says I will eventually run across a pair, and these were my 5th pair. The really good part of this story is that the folks at Luke’s really take their business seriously and made a great and successful attempt to minimize my frustration with having to trade out the shoes. Both store managers (and the Twitter guy) were prompt and professional. I didn’t have to get flustered not even a little bit. We even managed to make the trip to Colleyville (which is still a good distance away) useful by getting lunch at McAlester’s along with the shoes. There just aren’t many McAlester’s around. Therefore, I will always return to Luke’s Locker for my running shoes and I will continue to be loyal to my Asics gel-Nimbus. Additionally, I have found that Twitter is more useful than I originally thought. Social media has a purpose. All my followers on Twitter hopefully got to see that Luke’s is a good business as well. This post may be a little sappy, but I find that good customer service in any business is so difficult to locate these days that I am kind of beside myself when I find people that really know what it means. Happy running, ya’ll! Every other Sunday, I participate on #runchat on Twitter. Now, if that doesn’t sound bizarre coming from me, it should. Even more bizarre is that through #runchat I managed to find a very good company making a great product for runners and other athletes to use. Before I start blathering about the review, allow me to explain #runchat for those that may not know. Every other Sunday (actually tomorrow is the next), at 8PM EDT, two runners organize and moderate #runchat. By using the hashtag #runchat on your Twitter feed, (there’s the bizarreness again) you can answer the questions posed and talk with a lot of other runners about something important to most of us, running of course. In addition, there is always a sponsor along for the ride as well. One of those evenings, it was Premier Nutrition. They make a line of protein shakes and bars for active athletes. They were quite responsive to most of the runners present and offered many folks a sample of their wares. So, I signed on. Free is always good and you never know what you might find. Most companies offer samples of a little bit, like one bite, or a really tiny try out size. I was surprised when my box (yep, a box) arrived from Premier Protein soon after the #runchat. They sent a good selection of shakes and bars to try out. There were chocolate and vanilla shakes and several flavors of protein bars. I don’t know much about the benefits of using a protein supplement. I wouldn’t ever try those big can types with the muscle guys on the front. Somehow I think there is more than just protein in those cans. However, I do know that one of the best things a runner can do after a run is to drink a glass of chocolate milk. It helps put back a good quantity of protein in your system and it tastes good after a run. As I understand it, running tears down muscle a little. When you rest, the body goes to work trying to repair that muscle. It needs protein in your system to do so. Therefore, the reason for a glass of chocolate milk after a run. But, a good glass of chocolate milk can be 300 calories! Only on my long run days could I afford to take in that many extra calories. I still have weight to lose so I have to be careful how I use them. That’s one reason why I like Premier Protein shakes. It puts protein back in your body, but does it with only 160 calories. They also taste good and the price and availability are not bad either. I found mine later at Sam’s Club, but they are also at Wal-Mart. Yes, when my samples ran out, I actually bought some. I’m partial to the vanilla myself. So, did they make me run faster, jump higher, bike longer? I don’t know. It would take a really well controlled experiment to find that out. I just liked them because they had a good flavor, lower calories than chocolate milk, and a decent price. I don’t do a lot of reviews, but these guys were worth it. Not only were they willing to stick their necks out with a bunch of runners, but they do social media pretty well. I’ve talked to them since the first time and I’ve noticed many of my friends doing the same. They involve themselves with their consumers and that leads to trust between us, which is a good sign of a quality company to me. And, nope, except for the samples, I don’t get paid for doing this. OK, yeah so there were protein bars in the box too. I did try them out. But, it’s fair warning that there is another energy bar I’ve used for a long time and you would have to be really, really exceptional to beat them. The protein bars were alright, but they didn’t beat out my other bar. That’s still a win-win to me as I now have an added tool in the nutrition tool box that helps to fuel my runs, and bikes, and swims. I’m giving Premier Protein shakes an ‘A’. They are a lower calorie alternative to chocolate milk for getting some protein back in your body after a workout. Their price is acceptable and availability is good. Anything I don’t have to special order on line is a plus. They keep well too. I only refrigerate them so they are cold when I want one. Well worth trying out. David Walker on Why does this happen? bryanboard on Why does this happen? Come into my mind with me!